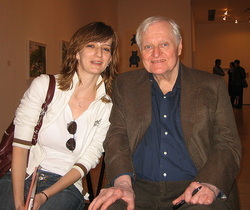 John Ashbery is recognized as one of the greatest twentieth-century American poets. He has won nearly every major American award for poetry, including the Pulitzer Prize, the National Book Award, the Yale Younger Poets Prize, the Bollingen Prize, the Ruth Lilly Poetry Prize, the Griffin International Award, and a MacArthur “Genius” Grant. In more recent Ashbery works, such as Girls on the Run (1999), Chinese Whispers(2002), Where Shall I Wander? (2005) and A Worldly Country (2007), critics have noted an infusion of elegy as the poet contemplates aging and death. Mary Oliver (born September 10, 1935 - October 13, 2012) is an American poet who has won the National Book Award and the Pulitzer Prize. The New York Times described her as "far and away, [America's] best-selling poet". Dušan "Charles" Simić (Serbian: Душан "Чарлс" Симић [dǔʃan tʃârls sǐːmitɕ]; born 9 May 1938- died 12 October 2012) is a Serbian-American poet and was co-poetry editor of the Paris Review. 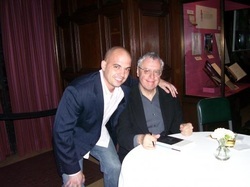 He was appointed the fifteenth Poet Laureate Consultant in Poetry to the Library of Congressin 2007. Charles Simic, “Eyes Fastened with Pins” from Charles Simic: Selected Early Poems. Copyright © 1999 by Charles Simic. Reprinted with the permission of George Braziller, Inc.